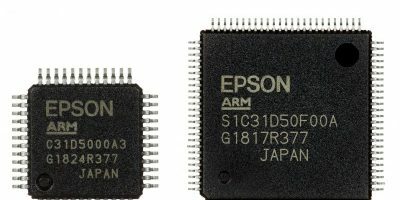 Recognising that sound is becoming a popular feature in home electronics, remote controllers for home appliances, industrial devices, health and fitness equipment and alarms in office buildings, shopping complexes, and factories, Epson has developed the S1C31D50, a 32-bit microcontroller with dedicated sound hardware for two-channel sound. The microcontroller is equipped with an Arm Cortex-M0+ processor, with a dedicated hardware processor which provides two-channel sound on a single microcontroller chip. The use of two channels enables music and voice to be played simultaneously. Voice speed can also be flexibly adjusted. The S1C31D50’s dedicated hardware processor plays sound without needing CPU resources, so that CPU resources can be allocated to other processes, even during sound playback. A high-compression algorithm (16kbits per second at 16kHz) reduces the size of sound data memory, making it possible to provide a large amount of sound data and sound data in multiple languages, says Epson. The company also offers a development environment to create sound data in Japanese, English, Chinese, and Korean without studio recording. Sound data is assigned a number in the PC tool and can be played back by specifying the assigned number in the hardware processor register, so there is no need to create and evaluate codes for linking sound data. A WAV format sound data is easily imported into the PC tool, adds Epson. The microprocessor also has a self-memory check function that can detect failures in built-in RAM, built-in flash, and external SPI-flash memories without using CPU resources. Voice speed conversion playback speed is adjustable in five per cent increments between 75 and 125 per cent.